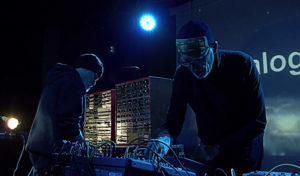 The Analog Session project was created by Alexander Robotnick and Ludus Pinsky in 2009 and launched with the “N5 From Outer Space” video that has so far achieved more than 400.000 views on Youtube. 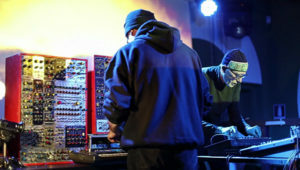 It’s all about the use of analog synthesizers and improvisation in Techno music. 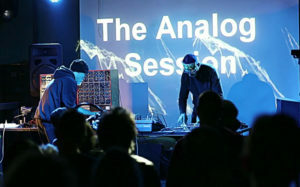 Since that first launch the Analog Session had been on stage only a few times due to the amount and size of its equipment which had to be handled and moved with extreme care. The live performance we held at “Combo Social Club” is a showcase of our present set-up: a number of parts such as the bass-drum and sometimes the bass itself are now played as backing track. And also the “N5 from outer space” theme and some phrases originally sequenced on an old Oberheim Biphonic ,that is still too heavy to be moved around. 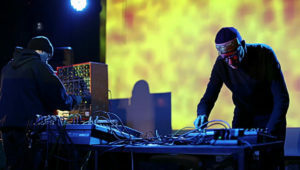 Ludus Pinsky controls and modifies the timbre of the note sequences played by the modular synth and plays a Poly800 keyboard he modified as follows: besides new filters and envelope generators he included a counter connected to the clock to set automated rhythm chords , often choosing odd divisions. 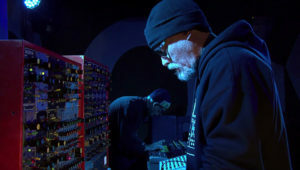 Alexander Robotnick mainly plays the Wasp and the Drum machine (Vermona) and controls the TB303 connected to the clock by its original sync input. The Wasp is a funny late 70s synth with a futuristic look and a touch keyboard Alexander Robotnick feels at ease with because he is no true piano player (whilst Ludus Pinsky is). We essentially improvise , moving along modal scales and sticking to no role. We alternate sound control and music improvisation to let the tracks breathe. Our melodies sound somewhat Oriental . We often improvise on a Phrygian mode but play it in an Indian raga mood rather than in the style usually adopted by Techno. Our music can no doubt be labelled as Techno. But we like to introduce improvisation into it and not just on “machines” but also on a music instrument which the synth truly is. Today you can’t talk about music without quoting the influences: in Alexander Robotnick’s case it’s jazz and progressive Rock of the 70s: Carlos Santana or Joe Zawinul you may even say 😉 And then the 80s where he got the habit of writing electronic sequences. For Ludus Pinsky it’s no doubt Dub which he used to practice and still does. Anyway he shares most of his influences with Robotnick, even though he is younger then him. On April 5, 2017 we played 6 tracks in 2 takes of one hour each, that is 6 tracks repeated twice. The first take had a limited audience and was focused on video-recording. The second take saw a larger audience and was more in a concert mood. 5 cameras – 3 standing and 2 hand-held – were used. The sound was recorded from our mixer stereo output, the microphones of the 2 standing cameras (to get some feel of the audience) and from a few separate outputs. The resulting video-clips are quite long , in some cases up to 10 minutes and they are the truthful documentation of our showcase. It was our intention not to use any special effect and not to add anything to the live recording. You may even find some errors and wrong notes but, all in all, we are satisfied with the result. WHAT CAN YOU FIND IN THESE VIDEOS? The attitude to improvise in Jazz and in Progressive Rock of the 70s. The early 80s world of analog electronics. The 90s “World” culture because the Analog Session is definitely not ethnic but the melodies we improvise have some of that feel. The “Electro” culture of the new millennium.